I generally find myself drawn to the work of artists whose names are not routinely discussed in the House of Art History. Adolf Dehn is one of those artists. I find the period between World War I (1914-1918) and the Great Depression (1929-1940) particularly fascinating in American art. It was a period that promised momentous changes in American art, but eventually left few American artists actually realizing those momentous changes in their own work. The First Armory Show in New York in 1913 was the first introduction to avant-garde art movements from Europe for most Americans. At that exhibition, Americans saw Symbolism, Post-Impressionism, Cubism, and Expressionism, among other styles. Although the Armory Show was panned by the public and critics alike, it initiated a brief period of modernist experiment among some American artists. The Great Depression more or less spelled a temporary hiatus for modernist experiment, during a period when most artists worked on government mural projects extolling the virtues of American life in social realist style. Dehn is considered one of the master printmakers of the mid-twentieth century. Having studied art in his native Minnesota and the Art Students League in New York, his first jobs as an artist were illustrating magazines. He met Ash Can School artists George Luks and John Sloan and found that he shared their interest in depicting realistic scenes of city life. While living in Europe between 1921 and 1929 he produced lithographs which satirized the excesses of wealthy members of society. He also became fascinated with landscape, particularly mountain landscape. Dehn’s first one person show of his lithographs was in 1930 right after the collapse of the world economy, and it initiated a period during which he worked primarily on public art projects. In 1937 Dehn made the crucial decision to paint in watercolor. Standard Oil hired him to do watercolors of their extensive holdings. After World War II, during the 1950s and 1960s, he achieved financial success with his painting. Although Abstract Expressionism was the big thing at the time, he refused to take his landscapes into abstraction because he felt it was too personal of a style and not understandable to the general public. 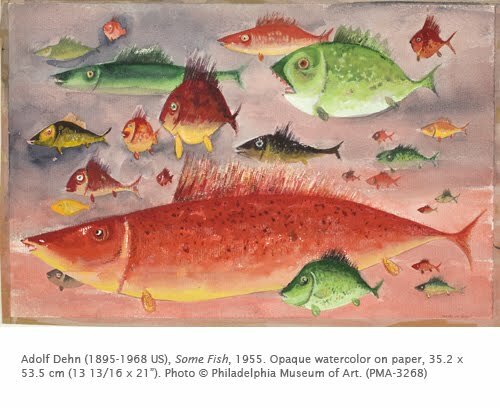 However, while one sees regionalism, social realism, and Japanese landscape painting in his work, Dehn was capable of producing watercolors of lyrical fantasy. Some Fish is one of those works. While the fish forms are depicted with a certain amount of realism, they have an almost whimsical, aware quality to their faces, and they float in an unspecified environment. 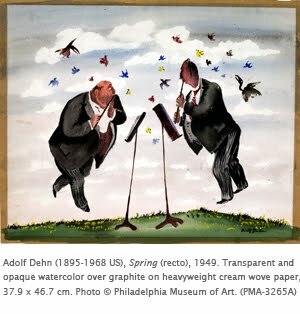 Another favorite watercolor by Dehn is the two flute players hovering in mid-air.